Clare Chemical manufactures transilluminators, hand lamps and electrophoresis units as well as associated accessories such as viewing glasses, screens and camera filters. All our Dark Reader blue transilluminators use pure visible blue light as the excitation source and there is NO damaging and dangerous ultra-violet radiation to worry about. 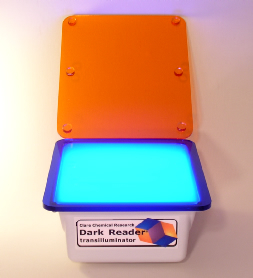 Dark Reader blue light transilluminators can be used for viewing a wide range of fluorescent samples including SYBR Green, GelStar, GelGreen, SYPRO Ruby, ProQ Diamond, fluorescein and various GFPs. A lot more information regarding the performance of the Dark Reader with selected dyes is available under the “Examples” label in the side-bar. The miniature DR22 blue LED transilluminator designed for those on a budget has a 13 x 12 cm viewing surface – just big enough for viewing mini-gels. 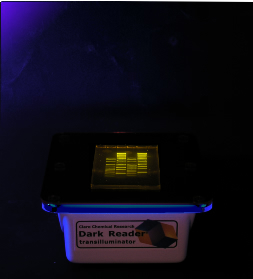 The compact DR46 blue LED transilluminator has a 19 x 15 cm viewing surface – convenient for viewing small DNA and protein gels as well as other smaller samples. The mid-size DR89 blue LED transilluminator has a 25 x 22 cm viewing surface and is ideal for most laboratory applications. Our largest unit, the DR195 transilluminator, which employs blue compact fluorescent lamps, has a massive 30 x 46 cm surface for viewing multiple samples and extra large gels. An amber screen that fits exactly over the blue surface is included with each transilluminator. The amber screen absorbs the blue excitation light, after it has illuminated the sample, thereby allowing the user(s) to clearly see the fluorescence. The amber screen can also be used as a camera filter. All Dark Reader transilluminators are also provided with a free pair of viewing glasses with exactly the same optical properties as the screen. The glasses are a key accessory for cutting bands out of gels. Optical: Multiple high intensity blue LEDs, Included accessories: Amber screen and DR viewing glasses. Optical: Multiple high intensity blue LEDs. Included accessories: Amber screen and DR viewing glasses. Optical: 2 x 32W compact fluorescent twin-tube lamps. Included accessories: Amber screen and DR viewing glasses.